Expanding modern town with origins as a medieval castle borough, and late medieval and 17th- to 19th-century buildings. 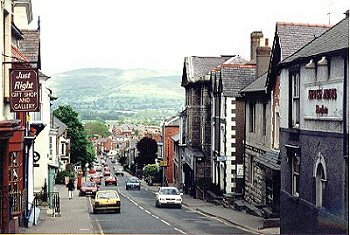 Denbigh was the capital of the ancient Welsh cantref of Rhufoniog. The cantref, together with the cantref of Dyffryn Clwyd, was granted by Edward I to Dafydd ap Gruffydd, brother of Llywelyn, in 1277, the site of the later castle probably being Dafydd's principal residence. Following the revolt led by Dafydd the cantref was confiscated by the crown and granted together with the cantref of Rhos to Henry de Lacy, earl of Lincoln in 1282, the two cantrefs which formed the lordship of Denbigh. The town is sited on a distinct outcrop which rises sharply above the bottom of the vale, between a height of about 50-140m OD. The town was a private plantation by the earl of Leicester and received its first charter in 1290. The town and walled medieval borough were planned as a single entity, like the contemporary royal castle-boroughs established by Edward I, but unlike the royal castle-boroughs at Caernarfon, Conwy and Beaumaris, the town at Denbigh was inconveniently sited at the top of a steep hill. The early walled town was eventually deserted, and between the early 13th century and the 16th century the town expanded and its focus shifted onto more amenable ground outside the town walls to the north-east. During the course of the 19th and 20th centuries the town has further expanded to the west, north-east, and south-east. The castle borough was created out of the earlier parish of Llanfarchell, of which the parish church of Eglwys-wen, dedicated to St Marcellus, lay about 2 kilometres to the east. For convenience of the garrison and townspeople St Hilary's chapel was built on the green outside the castle. The Carmelite friary was established to the north-east of the town in the late 13th century. An unfinished Elizabethan church within the town walls was commenced by Robert Dudley, earl of Leicester, who held the lordship between 1563 and his death in 1588, in an unsuccessful bid to move the see of St Asaph to Denbigh. Other churches and nonconformist chapels were built in the town during the course of the 19th century.